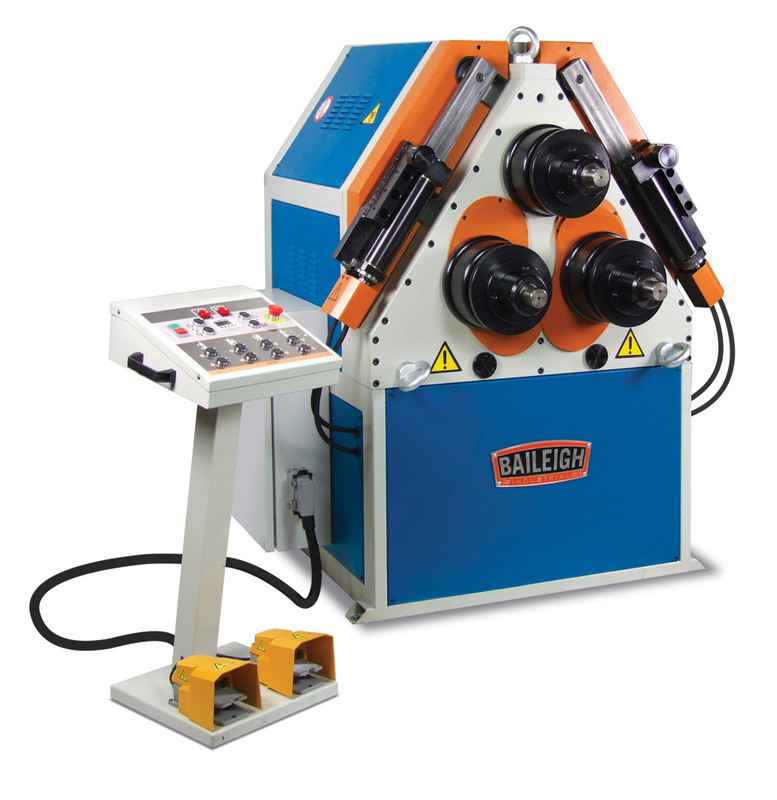 Baileighs R-H85 double pinch angle roll machine is a very powerful pipe roller capable of bending up to 3" Schedule 40 pipe and 3-3/8" x 3-3/8" x 1/4" angle iron. This machine is offered at a very attractive price considering the quality of design and construction, as well as the quality componentry that makes up this machine. This angle bending roll comes standard with a very ruggedly built frame that is made of heavy steel plate that is electro welded for further structural strength allowing for no flex at full capacity. This angle roll machine is considered a double pinch roll bender since the top roll is fixed and the two bottom rolls are on independent hydraulic cylinders with encoders that communicate to the DRO programmers for exact positioning of each roll. This allows for pre-bending and post-bending of material that saves production time and material waste. The DRO programmers make this a repeatable angle roll machine that is very important when production runs are required. This angle bending roll comes standard with an industrial grade transmission that drives all three rolls. A Siemens® inverter control protects the motor during startup under load and acts as an overload protection when bending at full capacity. Like all Baileigh angle rolls this comes standard with a set of segment rolls and lateral roll guides. Of course this ring roller can be positioned in the vertical mode for smaller OD's (outside diameters) and placed on its back in the horizontal mode for larger OD's. A movable operator pendant houses all major controls. Round Tube 4" (.120") 118"
Square Tube 2.75" (.157") 118"
Angle Iron 3.375" (.250") 68"
Flat Bar Easy Way 5"(1") 24"
Flat Bar Hard Way 4" (.787') 83"